I woke up this morning thinking about a horse card. Here is the tutorial. I started with a piece of Very Vanilla card stock. Tore through the sticky part of a post-it note to create a mask for the ground area. Sponged Blush Blossom over the sky then Groovy Guava. While keeping the mask on, I then inked up the tree from Le Jardin Botanique with Versafine Vintage Sepia and stamped the tree off once on scrap paper then stamped my card stock. This allows the tree to have a lighter more "misty" effect. I repeated this step for the second tree on the right side. The Oak Branch was inked with StazOn Timber Brown and stamped over the previous tree. I used by stamp-a-ma-jig for placement.Removed the post-it note from the ground area and sponged Old Olive. I then added a little Vintage Sepia. 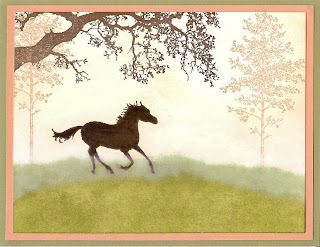 The horse was stamped in StazOn Timber Brown using my stamp-a-ma-jig and colored in with a Chocolate Chip Marker. Now the fun part - to create the mist very thin applications of ColorBox "Frost White" pigment ink was applied using a cotton swab. This pigment ink dries slow so it will give you as much time to remove some of your applied ink if it is too thick. Once dry you can always go back and apply another layer to make it whiter. I cut my Groovy Guava mat to 5 1/4" x 4" and assembled the card which is 5 1/2" x 4 1/4".